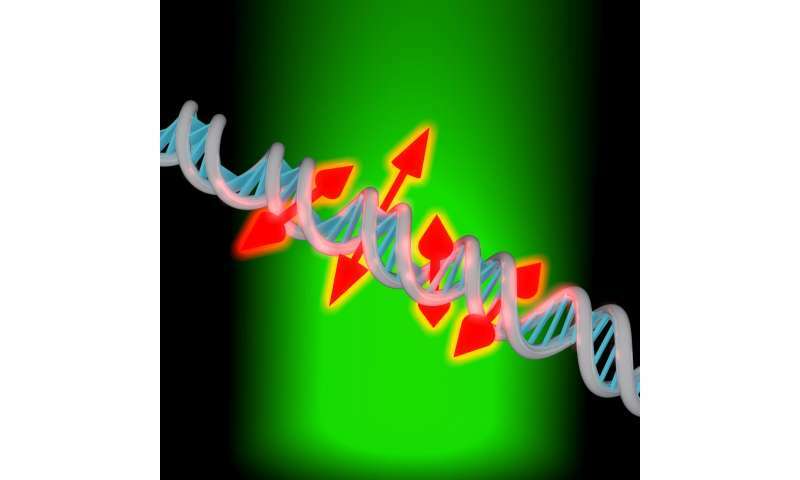 In The Optical Society's journal for high impact research, Optica, the research team led by Moerner describes their new technique and demonstrates it by obtaining super-resolution images and orientation measurements for thousands of single fluorescent dye molecules attached to DNA strands. "You can think of these new measurements as providing little double-headed arrows that show the orientation of the molecules attached along the DNA strand," said Moerner. "This orientation information reports on the local structure of the DNA bases because they constrain the molecule. If we didn't have this orientation information the image would just be a spot." Adam S. Backer, first author of the paper, developed a fairly simple way to obtain orientation and rotational dynamics from thousands of single molecules in parallel. "Our new imaging technique examines how each individual dye molecule labeling the DNA is aligned relative to the much larger structure of DNA," said Backer. "We are also measuring how wobbly each of these molecules is, which can tell us whether this molecule is stuck in one particular alignment or whether it flops around over the course of our measurement sequence." The new technique offers more detailed information than today's so-called "ensemble" methods, which average the orientations for a group of molecules, and it is much faster than confocal microscopy techniques, which analyze one molecule at a time. The new method can even be used for molecules that are relatively dim. The researchers tested the enhanced DNA imaging technique by using it to analyze an intercalating dye; a type of fluorescent dye that slides into the areas between DNA bases. In a typical imaging experiment, they acquire up to 300,000 single molecule locations and 30,000 single-molecule orientation measurements in just over 13 minutes. The analysis showed that the individual dye molecules were oriented perpendicular to the DNA strand's axis and that while the molecules tended to orient in this perpendicular direction, they also moved around within a constrained cone. Since fluorescent dye molecules with orientations most closely aligned with the laser light's polarization will appear brightest, measuring the brightness of each molecule in each camera frame allowed the researchers to quantify orientation and rotational dynamics on a molecule-by-molecule basis. Molecules that switched between bright and dark in sequential frames were rigidly constrained at a particular orientation while those that appeared bright for sequential frames were not rigidly holding their orientation. "If someone has a single-molecule microscope, they can perform our technique pretty easily by adding the electro-optic modulator," said Backer. "We've used fairly standard tools in a slightly different way and analyzed the data in a new way to gain additional biological and physical insight."